As implied in yesterday’s post on Freddie Patek, everybody loves a short guy. A tall guy? Not so much. I suppose it’s hard not to be impressed, as scouts must be, when a guy towering over the other guys on the high school or college diamond displays the coordination and skills of a top-flight regular-sized guy. Tall guys stick out. Moreover, the life of anyone who grew up playing sports is sure to be haunted by painful, disheartening memories of moments when a look across the court or the field or the diamond revealed that the opposition was comprised of kids who were a lot bigger than the viewer or anyone on the viewer’s team. (Take it from an expert in this regard: those were the games that were lost before they even began.) A scout would on some subconscious level probably want to help assemble a team that would never have to make that demoralizing pregame assessment. A team of towering Goliaths! Unbeatable! The fact is, however, unusually tall guys are as rare in baseball as unusually short guys. Check out this chart on Baseball Almanac, which provides support for the notion that tall guys excelling at the major league level are beating the odds every bit as much as short guys. They should be inspirational figures. The best they can hope for in terms of appreciation by fans is a kind of subtly dehumanizing awe, such as the reaction the 6’8” Richard began to elicit in the dominant latter stages of his stroke-shortened career. Even the best of all the tall guys of those years, Dave Winfield, would come to be defined and demeaned, at least partially, by withering comparisons to two fellow Yankees, Reggie Jackson and Don Mattingly. At the base of the comparisons was a belief that despite his prodigious athletic gifts, which surely included the notion that on top of his speed and cannon arm and power he was simply bigger than everyone else, Winfield just didn’t have the guts or the desire of a Mr. October or a Donnie Baseball. Winfield had the final word on the matter, of course, winning a World Series (with a clutch hit, no less) and gaining entry into the Hall of Fame. Most tall guys aren’t as fortunate. If they are a pitcher and they strike a guy out, or if they are a hitter and swat a home run, they are merely harnessing their prodigious talent, no more. If they fail to do these things, they make a nice, big target for boos. 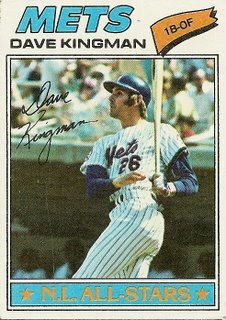 I imagine Dave Kingman heard his share of boos as he drifted from team to team throughout his career as a major league tall guy. In some ways he makes a perfect mirror image of Freddie Patek. While Patek is associated with one major league franchise for whom he provided all-around skill and team play and guts and fire, Kingman is known as a disliked ill-tempered one-dimensional journeyman, loyal to no one and with no one loyal to him. In many ways the defining seasons of Patek and Kingman occurred in the same year, 1977. The consistent Patek had a typically decent season for the team he will always be associated with, the Kansas City Royals: 53 steals, solid defense-anchoring glovework at shortstop, and an at least slightly pesky .320 on-base percentage. Kingman, for his part, struck out a lot and crushed a home run every few games, managing to blast 26 dingers in all, a somewhat down year for him, while playing for four different teams throughout the course of the year. (He would be shipped to a fifth team before the following year began.) The year ended for Patek with the shortstop weeping in the dugout because his team had lost. The team the Royals lost to went on the win the World Series. Presumably, a World Series ring, something Patek would never win, was given to Kingman, a late-season acquisition who didn’t appear in any postseason games for the team. Figures. Tall guys are always getting the world handed to them on the platter. Even the All-Time Tall Guy All-Star Team underscores the fact that the deck is stacked against tall guys. Turns out there are more unusually short guys in the Hall of Fame than unusually tall guys. (And the only guy who would really turn heads with his height if he came into a room, the team’s pitcher, is not even in the Hall of Fame yet.) If the all-time short guy team played the tall guy team, I might bet on the short guys. But I’d root for the tall guys. 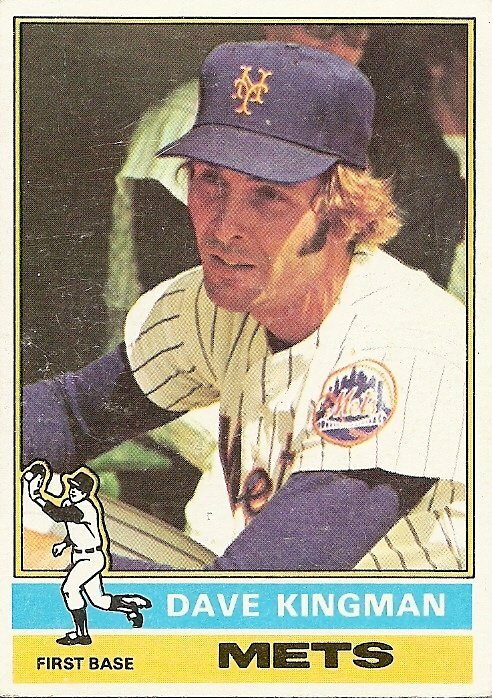 You are currently browsing the archives for the Dave Kingman category.